Rachel is a top student, third in her senior class academically, and has a weighted GPA of 4.3, with all “A’s” and many “A+” marks throughout high school. Rachel is passionate about sports, which she says has taught her self-discipline, how to work with peers, and “to find the truly important things in life.” An avid soccer player, Rachel has competed since she was five years old through club soccer as well as varsity soccer for her entire high school career, serving as team captain both junior and senior years. In the winter season, she has played varsity basketball throughout high school. She is also involved in many other extracurricular activities such as clubs and a youth group. She is treasurer of the National Honor Society at her school, and has been a part of this organization since sophomore year (the first year possible). She is an active member of the National Art Honor Society, the Partners Service Organization (helping “high needs” students at the school), Students Against Destructive Decisions (to encourage students to make wise choices about driving), Young Life (a religious-oriented club), and her church youth group. She has done extensive volunteer work at a retirement center, at church, and at a summer camp and has gone on mission trips with her pediatrician father to Africa. 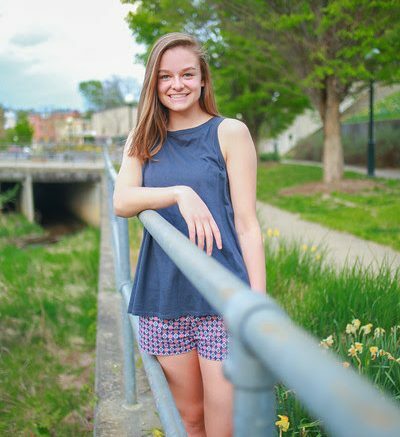 Since she was just five years old, Rachel has spoken annually to first year medical students at the University of Virginia about living with PKU in conjunction with her dietitian, who speaks about the technical aspects. Rachel has received a host of academic and athletic awards throughout her high school career. She has been selected for the First Team All-District soccer team throughout high school. She received the Second Team All-Conference award freshman year and First Team All-Conference award her sophomore year. She was named to the Second Team All-Region, was District Player of the Year her junior and senior years, and made First Team All-State her senior year. She was the recipient of the Superintendent award, the highest award for overall GPA, throughout high school. She also received the Academic Excellence award in Mathematics her junior year. She was chosen as the junior chance to lead a completely normal life. PKU has taught me that life isn’t always “fair” and sometimes you just need to embrace the things that make you different.” Rachel maintains a low blood phe level on a strict PKU diet, and started a Kuvan trial in June 2017.